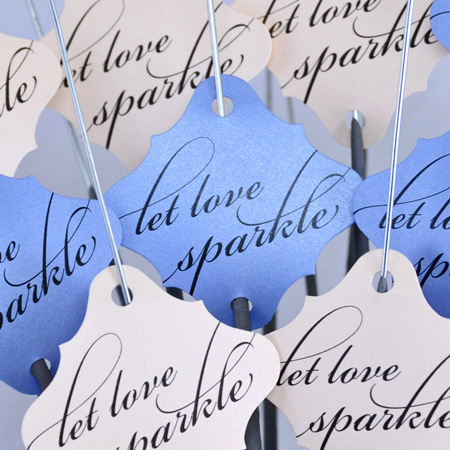 Let Love Sparkle with Favor Labels! 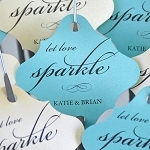 Our Standard Wedding Sparkler Tags are a great way to "dress up" the sparkler display at your wedding! This classic style of wedding favor labels is designed to coordinate with any wedding theme and décor. Our labels for wedding favors are made of thick 98-lb shimmer cardstock, so that they are durable and can be held onto long after the event for memorabilia. 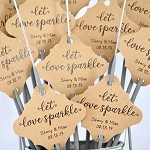 "Let Love Sparkle" is printed in black ink and a hole at the top and bottom of each tag makes it easy to slide each sparkler through. 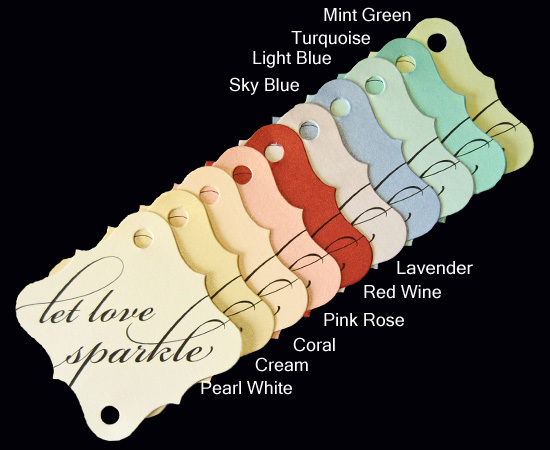 The wedding favor labels Available in 10 different colors to match your event! This ensures that no matter what color theme of your wedding, there is an option that will pair well with your décor. In addition, display your "tagged" wedding sparklers in one of our wedding sparkler buckets, available in galvanized or rustic finishes. Tags conveniently ship out in 2 to 3 business days. 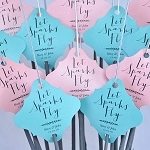 These sparkler tags are a perfect way to dress up the sparklers. These are on nice, heavy cardstock and add something fun to the sparklers. I would definitely recommend them. I purchased 50 sparklers and so I purchased 25 of the tags. I think it looks better not to have every sparkler with a tag. These are high quality and just the perfect touch! Absolutely loved the sparklers and the sparkler bin we bought. They looked beautiful, were so much fun for all the guests, and really created a beautiful send-off for my sister's wedding. Will definitely purchase again from this vendor for our next event!